Update: The Matthews Community Farmers Market will be closed Saturday because of weather. From market manager Pauline Wood: "As weather predictions have become more dire, we felt it was in the best interest of our customers and vendors to skip it this time. Our next scheduled farmers' market is Feb. 13 from 8-10am." The Charlotte Regional Farmers Market will be open, although several vendors have cancelled, including Gilcrest Natural Farm, Grateful Growers, New Beginning Farm and Lil Bit of Heaven, Laughing Owl Farm. Market manager Frank Suddreth said the market will be open for anyone who can make it out, though. "We put out salt around the buildings and I turn the heat on about 3 o'clock in the morning." The Davidson Farmers Market wasn't scheduled to be open this week. Their winter market is still planned for next Saturday. If you need to stock up and you can wait a couple of days, several farms already plan to be at the Charlotte regional market from 1-5 p.m. Tuesday. Weather permitting, of course. If you already bought tickets, you can get a refund by calling the Mint. With the sad news that the annual Blue Ridge Barbecue Festival in Tryon has been cancelled, apparently permanently, barbecue fans may need a new occasion. If you can get over to Durham on Jan. 30, you can go to Pork & Pinot. Yes, pinot noir as in wine. Yes, pork as in barbecue. Debbie Moose's blog has details. As long as we're thinking about barbecue (and is there ever a time when I'm not thinking about barbecue, no matter how subliminally? ), I added a new blog link lately that is a ton of fun to read: BBQ Jew. Don't let the name stop you. The humor of these particular Chosen People is choice, and they post reviews of barbecue restaurants around the state. And now, finally, let us bow our heads at the passing of the Blue Ridge Barbecue Festival. Truly sad news. I was a judge many, many times over the years. I shall see it in my dreams: A verdant valley with a mountain on one side and a picturesque rocky stream along the edge, filled with barbecue teams, cookers and carnival rides. Smoke rising above the rigs, the old hut on one side filled with the crazy cacophony of barbecue judges waiting to see if they got lucky enough to be assigned the whole hog category. The nice volunteers in aprons who used to sneak us extra servings of Italian ice between rounds of barbecue. And my drives home on U.S. 74 at the end of the day, pinching myself to keep alert with the fat from a pound worth of pork trickling through my brain. Those, I shall see in my nightmares. Eat pancakes and help Haiti: Forest Hill Church will host a flapjack fundraiser starting at 7 a.m. Saturday at Applebee's, 5100 Piper Station Drive. Tickets are $8 at the door, or call 919-388-5886 and get you a short stack, sausage, milk, juice and coffee. The money goes toward medication for the church's clinic in El Seibo, Dominican Republic. Shake it up at the Mint: "The Science Behind the Cocktail Tour" is coming to the Mint Museum/Randolph (ie, the "old" Mint) from 6-8 p.m. Feb. 11. Speakers are Tim Laird, chief entertaining officer for Canadian Mist and "spirits scientist" Steve Hughes. Tickets are $10 for museum members and $15 for nonmembers; it's only to people over age 21, of course. Proceeds benefit the Mint. Reservations are suggested. Go to http://www.mintmuseum.org/ or call Elizabeth Isenhour at 704-337-2009. Ballantyne has got meat: Fans of the Waxhaw butcher and deli What's Your Beef (and excellent butcher Vic Giroux) should know the shop has moved to a new location, 14021 Conlan Circle in Ballantyne. If you get as lost in Balli Hi as I do, it's in Ballantyne Quad, neat Ballantyne Commons and John J. Delaney. Where does he find the time: Bobby Flay is now a contributing editor to Parade magazine, which comes in your Sunday Observer. He'll write (or his name will be on the article - raise your hand if you really think celebrity chefs write their own stuff) a monthly article called "Cook It!" It debuts Jan. 31 with a Cuban-themed Super Bowl menu. While we're on the subject of wine: Tickets go on sale Monday for the Charlotte Wine & Food Festival. If you're never attended or don't know this event, it's worth checking the list. First, it only happens every two years, so you don't want to miss it. It's also a fundraiser for several local charities, so the money stays in this area. And while many wine events can have the aroma of exclusivity, this one isn't one of them. Yes, there are high-end events and big-ticket tastings and dinners. But it also has a very reasonably priced one, the Saturday Vintner Tasting at Gateway Village. I'm not a big-ticket gal -- $8 bottles are usually my budget -- but I've attended almost all of the Vintner Tastings because they're a great deal. For $30, you get to try samples of almost all the wines featured during the weekend, most of them poured by the people who make them. If you've always wanted to know what Silver Oak tastes like or compare several levels of ports without selling your grandmother's silver, this is your chance. The festival also added classes and those will come back this year. They range from really basic, entry-level wine information and up to more challenging guided tastings. Last time, they did a tasting of 100-point wines. This year, they're doing one called "Almost Perfect" -- wines that fell short of the top rankings, with an instructor explaining what their flaws are. There are two first-time events this year: Charlotte's first-ever wine competition on Feb. 6 will evaluate wines that will be a part of the festival. (FYI, I'm one of the judges). This should be useful because the wines also will be available in local restaurants and wine stores. Second, they're branching out from wine. In addition to the long list of restaurants that host vintner dinners showcasing the wines, The Liberty will hold the event's first beer dinner. Prices for most things are still being set, so you'll have to check the Web site Monday for the full list: http://www.charlottewineandfood.org/. But many things sell out quickly, so don't put it off. Guess who won a wine book? I'm a bit late on this one, folks. I apologize. I had to go out and eat all that gas-station chicken -- and then find a gym that was open for 24 hours to make up for it. But Random Generator has spoken: The winner of "Drink This: Wine Made Simple" is Suburban Prep. SubPrep, send me your mailing address at kpurvis@charlotteobserver.com and the book will be on its way. Grateful Growers has added dog food, ground from trimmings and organ meats. They promise it's all natural, hormone-free, etc. They also promise to fry some up and eat it themselves, so if you see the sampling skillet out at the Charlotte Regional Farmer's Market, you might want to ask before you grab a toothpick. $3 a pound, at their various locations. It's an on-weekend for the Matthews Community Farmer's Market winter market. But manager Pauline Wood warns that the cold was mighty hard on things that grow in the ground. And things that lay eggs above the ground. Eggs and green vegetables may be in shorter supply. Even the honey froze. (Which sounds weirdly delicious to me. Mmmm, honey pops.) But there will be lots of local meat and baked goods, plus some vegetables and some eggs. Plan accordingly. There are new options for local meat availability for those who don't like to get up early enough to hit the markets: Healthy Home Market on South Boulevard and in Davidson is stocking Grateful Growers, and HHM on South Boulevard has Proffitt Family Farms meats, too. Hillbilly Produce, Common Market, Reid's and Earth Fare all have various Grateful Growers products. 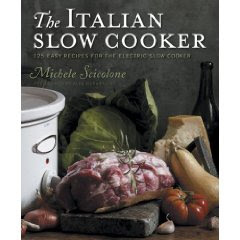 Cee -- ceevegnashville@gmail.com -- you're the winner of "The Italian Slow Cooker," by Michele Scicolone. Send your snail mail address to me at kpurvis@charlotteobserver.com and I'll send you the book. Ready for the next giveaway? I've been a fan of the writing of Minnesota's Dara Moskowitz Grumdahl for years. She's smart and a little irreverent, and always enlightening. 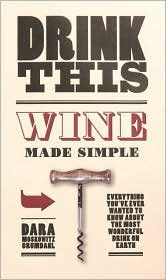 Now she's turned that writing style into a wine book, "Drink This: Wine Made Simple." I read the book over the holidays and got a lot out of her approach, which breaks down wine into a few basic styles, then takes you through how to learn those styles. She includes lots of useful tips (if you really want a bargain, look on the bottom shelves) and suggestions for how to hold wine tastings focused on a specific wine. If you really want a bargain on simple wine instruction, here's your chance: Post here for a chance at the random drawing for "Drink This." If you sign on as anonymous, add a way I can identify you. We'll post the winner next Monday. "American Game Birds," 10 a.m.-1 p.m. Saturday, Jan. 23, at Zink, 201 N. Tryon St. $35, reservations 704-444-9001. "Warm Your Bones," taught by Greg Balch of Ratcliffe on the Green, still has openings at Cooking Uptown on 7th Street. It's $65, and it's 10:30 a.m.-12:30 p.m. Saturday, Jan. 23. The store also has its list of February and March classes up, so now is a good time to get a seat. Go to www.cookinguptown.com for details. The Liberty gastropub, 1812 South Blvd., is starting classes with chef Tom Condron this Saturday, Jan. 16. Classes include wine and beer pairings and printed recipes to take home for $25. They're already got a year's worth scheduled. Call 704-332-8830 for details or go to www.thelibertycharlotte.com. I'm still waiting to hear from Debbie from Mount Pleasant, who won the Julia Child DVD "The Way to Cook," and Mpierce/Michelle of Rock Hill, who won "The Golden Book of Baking." Ladies, if either of you is out there, please send your mailing addresses to me at kpurvis@charlotteobserver.com. And now, time for a new giveaway. Italian cookbook fans should recognize the name Michele Scicolone. In addition to teaching cooking classes in New York, she's written 14 cookbooks, covering every aspect of Italian cooking. Well, almost everything: Her newest book is just out, "The Italian Slow Cooker." Given the slow, braised nature of many Italian classics, this one looks like a natural, and it's almost screams "winter food." If you'd like to try for a copy, post a comment here with a name I can use to recognize you. We'll have a random drawing next week. And if you enter, don't forget to check back to see if you won. Didn't Dove chocolate used to push the idea of a chocolate being a little break from life? Break time is over, baby. Martha is in the house. One of Santa's stocking choices at my house was the new Dove caramel and peppermint chocolates. (I can vote for each as being worth the calories, especially the two-level peppermint version.) But as we made our way through the foil wrappers, my husband and discovered that Martha now adds a little Christmas "hint" inside each one. Nothing like adding a dose of guilt to your holiday indulgences. "Keep lighting low and candles lit when entertaining." Candles, schmandles. Keep yourself lit, Stewart, and let the rest of us enjoy our chocolate in peace. Welcome to 2010. Whenever I get another holiday behind me, I take a minute to think about what I did and didn't do. I try to make note of which recipes I used, which cookies turned out really well, which version of collards I persuaded my collard-hating husband to eat. 1. Which cookie did you get or make that turned out particularly well? Did you add something new to your repertoire? 2. Did you wish The Observer had given you directions for cooking collards for New Years? We skipped the lucky foods this year in favor of rounding up great recipes froim 2009. But there's always next year, so let me know if that's something we need to add.